Thus radioisotopic geochronology was born, almost immediately shattering centuries of speculative conjectures and estimates and laying the foundation for establishment of the geologic timescale, the age of the Earth and meteorites, and a quantitative understanding of the rates of processes ranging from nebular condensation to Quaternary glaciations. There is an important subplot to the historical development of radioisotopic dating over the last hundred years, which, ironically, arises directly from the subsequent history of the U-He dating method Rutherford described in 1905. Almost as soon as radioisotopic dating was invented, it was recognized that the U-He [or later the (U-Th)/He method], provided ages that were often far younger than those allowed by stratigraphic correlations or other techniques such as U/Pb dating. Clearly, as R.J. Strutt noted in 1910, He ages only provided "minimum values, because helium leaks out from the mineral, to what extent it is impossible to say" (Strutt, 1910, Proc Roy Soc Lond, Ser A 84:379-388). For several decades most attention was diverted to U/Pb and other techniques better suited to measurement of crystallization ages and establishment of the geologic timescale. Gradually it became clear that other radioisotopic systems such as K/Ar and later fission-track also provided ages that were clearly younger than formation ages. In 1910 it may have been impossible to say the extent to which He (or most other elements) leaked out of minerals, but eventually a growing understanding of thermally-activated diffusion and annealing began to shed light on the significance of such ages. The recognition that some systems can provide cooling, rather than formation, ages, was gradual and diachronous across radioisotopic systems. Most of the heavy lifting in this regard was accomplished by researchers working on the interpretation of K/Ar and fission-track ages. Ironically, Rutherfordπs He-based radioisotopic system was one of the last to be quantitatively interpreted as a thermochronometer, and has been added to K/Ar (including 40Ar/39Ar) and fission-track methods as important for constraining the medium- to low-temperature thermal histories of rocks and minerals. Thermochronology has had a slow and sometimes fitful maturation from what were once troubling age discrepancies and poorly-understood open-system behaviors, into a powerful branch of geochronology applied by Earth scientists from diverse fields. Cooling ages, coupled with quantitative understanding of crystal-scale kinetic phenomena and crustal- or landscape-scale interpretational models now provide an enormous range of insights into tectonics, geomorphology, and subjects of other fields. At the same time, blossoming of lower temperature thermochronometric approaches has inspired new perspectives into the detailed behavior of higher temperature systems that previously may have been primarily used for establishing formation ages. Increased recognition of the importance of thermal histories, combined with improved analytical precision, has motivated progress in understanding the thermochronologic behavior of U/Pb, Sm/Nd, Lu/Hf, and other systems in a wide range of minerals, filling out the temperature range accessible by thermochronologic approaches. Thus the maturation of low- and medium-temperature thermochronology has led to a fuller understanding of the significance of radioisotopic ages in general, and to one degree or another has permeated most of geochronology. Except in rare cases, the goal of thermochronology is not thermal histories themselves, but rather the geologic processes responsible for them. Thermochronometers are now routinely used for quantifying exhumation histories (tectonic or erosional), magmatism, or landscape evolution. As thermochronology has matured, so have model and interpretational approaches used to convert thermal histories into these more useful geologic histories. Low-temperature thermochronology has been especially important in this regard, as knowledge of thermal processes in the uppermost few kilometers of the crust require consideration of coupled interactions of tectonic, geodynamic, and surface processes. Exciting new developments in these fields in turn drive improved thermochronologic methods and innovative sampling approaches. This volume presents 22 chapters covering many of the important modern aspects of thermochronology. The coverage of the chapters ranges widely, including historical perspective, analytical techniques, kinetics and calibrations, modeling approaches, and interpretational methods. In general, the chapters focus on intermediate- to low-temperature thermochronometry, though some chapters cover higher temperature methods such as monazite U/Pb closure profiles, and the same theory and approaches used in low-temperature thermochronometry are generally applicable to higher temperature systems. 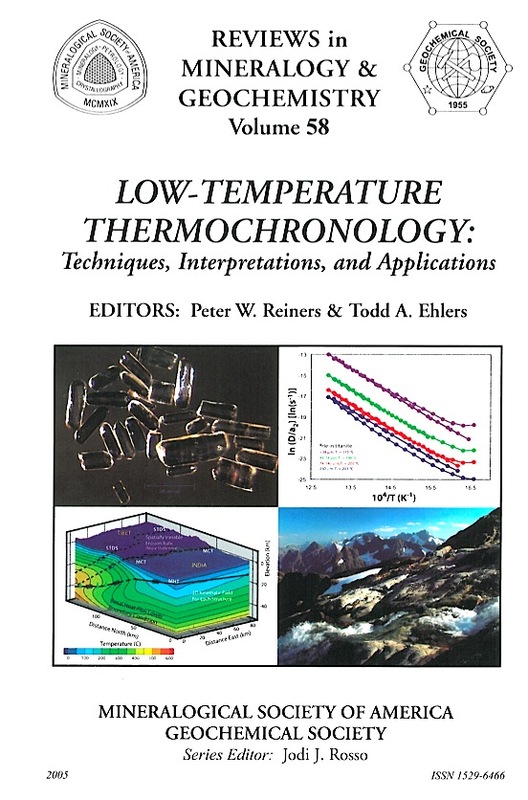 The widely used low- to medium-temperature thermochronometric systems are reviewed in detail in these chapters, but while there are numerous chapters reviewing various aspects of the apatite (U-Th)/He system, there is no chapter singularly devoted to it, partly because of several previous reviews recently published on this topic. Chapter 1 by Reiners, Ehlers, and Zeitler provides a perspective on the history of thermochronology, comments on modern work in this field and general lessons on the potential for noise to be turned into signal. This chapter also provides a summary of the current challenges, unresolved issues, and most exciting prospects in the field. Much of the modern understanding of kinetic controls on apparent ages, thermal histories, and sampling approaches comes from decades of progress in fission-track dating, a method that remains as essential as ever, partly because of the power of track-length measurements and the depth of (at least empirical) understanding of the kinetics of track annealing. Tagami, Donelick and OπSullivan review the fundamentals of modern fission-track dating (Chapter 2). Two of the most commonly dated, well-understood, and powerful minerals dated by fission-track methods are apatite and zircon, and the specifics of modern methods for these systems and their kinetics are reviewed by Donelick, OπSullivan, and Ketcham (Chapter 3), and Tagami (Chapter 4). Although 40Ar/39Ar and (U-Th)/He dating methods followed somewhat different paths to their modern thermochronologic incarnations, they have many features in common, especially in the kinetics of diffusion and closure. Zeitler and Harrison review the concepts underlying both 40Ar/39Ar and (U-Th)/He methods (Chapter 5). Zircon was one of the first minerals dated by the (U-Th)/He method, but has only just begun to be used for thermochronometry of both bedrock and detrital samples, as reviewed by Reiners (Chapter 6). Continuous time-temperature paths from intracrystalline variations of radiogenic Ar proven perhaps the most powerful of all thermochronologic approaches, and an innovative analogous approach in He dating (4He/3He thermochronometry) is revealing remarkably powerful constraints on the extreme low temperature end of thermal histories, as reviewed by Shuster and Farley (Chapter 7). Thermochronology of detrital minerals provides unique constraints on the long-term evolution of orogens, sediment provenance, and depositional age constraints, to name a few. Bernet and Garver (Chapter 8) review the essentials of detrital zircon fission-track dating, one of the most venerable and robust of detrital thermochronometers, and in Chapter 9, Hodges, Ruhl, Wobus, and Pringle review the use of 40Ar/39Ar dating of detrital minerals, demonstrating the power of detrital muscovite ages in illuminating variations in exhumation rates in catchments over broad landscapes. (U-Th)/He thermochronometry presents several unique interpretational challenges besides new kinetics and low temperature sensitivity. One of these is long-alpha stopping distances, and its coupling with diffusion and U-Th zonation in age corrections. Dunai reviews modeling approaches to deal with these issues in interpreting low-temperature thermal histories (Chapter 10). Ketcham (Chapter 11) reviews the theory and calibration of both forward and inverse models of thermal histories from fission-track and (U-Th)/He data, and makes some important points about the interpretations of such models. Translating thermal histories into exhumational histories and their tectonic or geomorphic significance across a landscape requires quantitative understanding of the thermal structure of the crust and how it is perturbed, a review of which is presented by Ehlers (Chapter 12). Braun (Chapter 13) illustrates the power of low-temperature thermochronometry to constrain topographic evolution of landscapes over time, using PECUBE. Gallagher, Stephenson, Brown, Holmes, and Ballester present a novel method of inverse modeling of fission-track and (U-Th)/He data for thermal histories over landscapes (Chapter 14). Continuous time-temperature paths from closure profiles or their step-heating-derived equivalents are, to some degree, the holy grail of thermochronology. 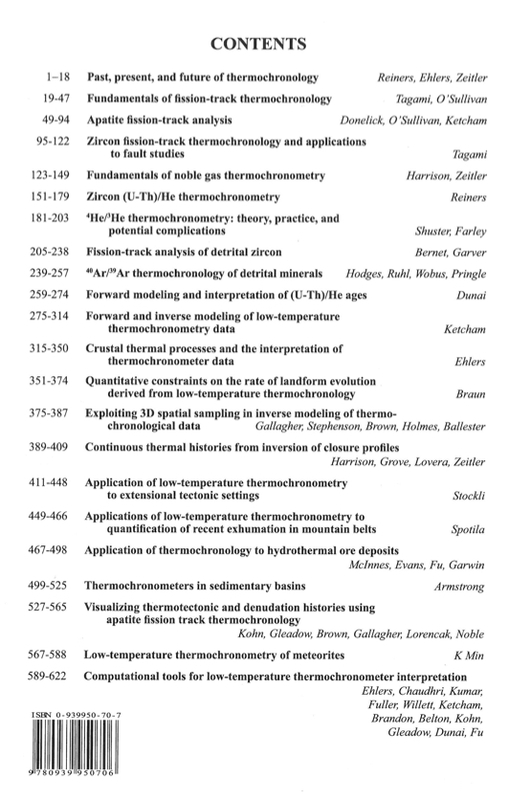 Harrison, Zeitler, Grove, and Lovera (Chapter 15) provide a review of the theory, measurement, and interpretation of continuous thermal histories at both intermediate and high temperatures, derived from both K-feldspar 40Ar/39Ar and monazite U/Pb dating. Extensional orogens provide a special challenge and opportunity for thermochronometry because tectonic exhumation by footwall unroofing often outstrips erosional exhumation, and often occurs at high rates. As Stockli shows (Chapter 16) thermochronology in these setting provides opportunities to measure rates of a number of important processes, as well as obtain a snapshot of crustal thermal structure and its imprint on thermochronometers with varying closure temperatures. Spotila (Chapter 17) reviews the use of thermochronology applied to tectonic geomorphology in a wide range of orogenic settings, introducing the concept of denudational maturity. Thermochronology has found great utility in economic geology, and newly developed approaches pose great potential in this area, and shown by McInnes, Evans, Fu, and Garwin in their review of the use and modeling of thermochronology of hydrothermal ore deposits (Chapter 18). The thermal histories of sedimentary basins are also critical to understanding thermal maturation of hydrocarbons, but are also critical for understanding basin formation, erosional histories of source regions, fluid flow, and climate change and other temporal signals preserved in sedimentary rocks. Armstrong (Chapter 19) reviews these issues and the use of thermochronology in deducing the thermal histories of sedimentary basins. Drawing on large datasets of bedrock apatite fission-track dates, Kohn, Gleadow, Brown, Gallagher, Lorencak, and Noble demonstrate the power of modeling, and, importantly, effectively visualizing, integrated thermotectonic and denudational histories over large regions (Chapter 20). Thermal histories of meteorites provide constraints on a wide range of fundamentally important processes, including nebular condensation and early solar-system metamorphic histories, and the dynamics of interplanetary collisions and shock metamorphism. Min reviews thermochronologic approaches to understanding meteorite thermal histories (Chapter 21), including new methods and approaches. Finally, the importance of robust models with which to interpret thermochronologic data is underscored by the review of the Software for Interpretation and Analysis of Thermochronologic Data (Chapter 22), summarized and compiled by Ehlers, for programs associated with the work of authors in this volume and others. Todd A. Ehlers, Tehmasp Chaudhri, Santosh Kumar, Chris W. Fuller, Sean D. Willett, Richard A. Ketcham, Mark T. Brandon, David X. Belton, Barry P. Kohn, Andrew J.W. Gleadow, Tibor J. Dunai, Frank Q. Fu, (2005), Computational tools for low-temperature thermochronometer interpretation, Reviews in Mineralogy and Geochemistry, v. 58, p. 589-622. Copyright Information: The software is provided as a courtesy to the broader scientific community and in some cases represents years of effort by the contributors. The software can be used free of charge for non-profit research, but persons with commercial or for-profi t interests and applications should contact the software contributor concerning the legalities of its use. Bugs and Software Use: Although every effort has been made by the contributors to assure the software provided functions properly and is free of errors, no guarantee of the validity of the software and results calculated can be made. Thus, application of the software is done at the users own risk and the software contributors are not accountable for the results calculated. Availability of Source Code: The source code is freely available for some of the software packages provided below. Persons interested in acquiring the source code should contact the software contributor. Software Updates: Software updates will occasionally be posted to this web page. However, users can also contact the software contributor directly if they desire to have the most recent version. Suggested format for referencing software described in this chapter: Each computer program described in this chapter was developed by different contributors. To assure each contributor receives appropriate credit for their contribution please include the contributor and software name in publications that benefited from use of software. For example, programs in this volume could be cited in the following way, “We computed erosion rates using the program AGE2EDOT developed by M. Brandon and summarized in Ehlers et al. (2005).” If additional publications are available describing the software (e.g., HeFTy; Ketcham et al. 2005) please also reference those publications. TERRA. Thermochronometer Exhumation Record Recovery Analysis. Main contributor and contact person: Todd A. Ehlers (University of Michigan), email: tehlers @ umich.edu. Most recent Windows XP version (10/09/05) available here. Most recent Red Hat Enterprise Linux version (10/09/05) available here. Geotherm calculation programs associated with figures in Chapter 12 by Ehlers. HeFTy and FTIndex. Contributor and contact person: Richard Ketchum (University of Texas, Austin), email: ketcham @ mail.utexas.edu. Most recent version (10/09/05) available here. TASC. Main contributor and contact person: David Belton (University of Melbourne), email: dxbelton @ unimelb.edu.au. DECOMP. Main contributor and contact person: Tibor Dunai (Vrije University), email: tibor.dunai @ falw.vu.nl. 4DTherm. Main contributor and contact person: Frank Fu (University of Sydney and CSIRO Exploration and Ming), email: qifu6346 @ mail.usyd.edu.au.